Anti spam and anti virus email filtering solutions are one of the best ways to reduce your business´s exposure to threats such as phishing, malware and ransomware. Even if you have implemented web filtering, anti virus software and network monitoring tools, anti spam and anti virus email filtering solutions can stop the threats at source and prevent them from entering your network. Advanced anti spam and anti virus email filtering solutions achieve spam detection rates in excess of 99.9% and identify 100% of inbound malware. The solutions can also be used to scan outbound emails in order to keep your IP reputation healthy and avoid your IP address being blacklisted by a global block list agency – which could also have consequences for accessibility to your web site(s). Greylisting is a process in which all incoming emails are returned to their originating mail servers with a request for the email to be resent. Typically this process delays the receipt of emails by a minute or two; but, due to spammers´ mail servers being too busy to respond to the request, spam emails are never returned at all. When a greylisted email has been returned, it goes through a series of secondary processes. One of these processes – SUBRL filtering – checks any URLs contained within the body of the email to ensure they do not appear on a list of URLs registered in previous spam emails. This process significantly reduces the likelihood an employee will fall victim to a phishing attack. Double anti virus software does not mean double the protection, but provided the dual anti virus engines are complimentary (i.e. not both proprietary software), you will get a higher malware detection rate than just using a single defense. Advanced anti spam and anti virus solutions typically use proprietary software and open source software in unison. In most cases, implementing an advanced anti spam and anti virus solution does not mean you need to acquire an advanced skill set. Most vendors understand businesses want set and forget online security solutions, and make the configuration and management of their anti spam and anti virus email filtering solutions as straightforward as possible. Furthermore, the trend in recent years has been to move away from high maintenance solutions that protect each device individually. The majority of advanced anti spam and anti virus email filtering solutions are administered from a centralized web-based portal through which the filtering parameters can be synchronized with directory tools in order to set flexible user policies. 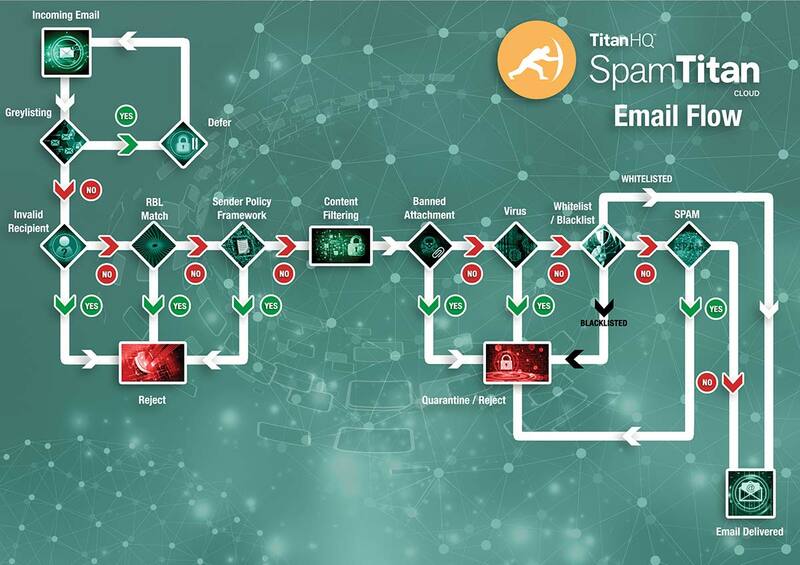 If you are concerned about the volume of spam evading detection in your business, and would like to enhance your network security with a low maintenance solution, why not try an advanced anti spam and anti virus solution from SpamTitan for free? We offer all businesses the opportunity to try our online security solutions free of charge in order you can evaluate them in your own environment. In order to take advantage of this opportunity, please speak with our Sales Technicians. They will answer any questions you have about advanced anti spam and anti virus solutions and discuss your current security mechanisms to determine which would be the most effective deployment option – the choice exists of a cloud-based solution or an on-premises anti spam software solution. During the trial you will have the full support of our Sales Technicians to help you find the optimum settings for your SpamTitan filter. Then, once the trial has ended, should you agree the benefits of our anti spam and anti virus solution is worth keeping, no further configuration of SpamTitan will be necessary. Contact us today to find out more.